Knowing how the technology comes together, we can now consider how it is that Nissan will make it so affordable and get an idea of which vehicle(s) it will appear in first. After looking at the technology and how it works, in a basic sense (see the first half of this two-part article here), we can now coherently consider why it will be inexpensive, at a promised $1,000 option upgrade, and make some guesses as to which vehicles it may appear in first. The current rendition of the Autonomous Driving car is a Nissan LEAF outfitted with a lot of computer hardware, as seen in a special report at Jalopnik. We can see that several computers, readout screens, and other things have been retrofitted to a car in order to operate the self-driving abilities it has. Other extras, likely to show up in some form or another in production Autonomous Driving cars, are also included, like the lighted steering wheel to indicate the car is driving itself, and the panic button in case something goes wrong and you need the car to pull over, stop, and call for help. We can also see that the system is, for the most part, not hackable by those who wish to take control of the car from afar as its only outside communication for the self-driving is the GPS unit for directions. So while the GPS may be changed, no one can actually physically take over the car by remote control because everything else is self-contained. As mentioned in our last article, most of the technologies that go into Nissan's Autonomous Driving system are already in use in cars everyday. These are the relatively cutting-edge driver assist technologies that proliferate in luxury and higher-end vehicles right now. All Nissan is doing is combining them into one intelligent system and then adding in artificial intelligence (AI) to take all of that data and use it to operate the vehicle robotically. This means that except for the computers and software needed to control things, everything else required in this self-driving system is already available. If the car that Autonomous Driving is going to be added to already has most of these systems installed as upgrade or premium options, then the only cost to Nissan to add in the self-driving option is to add some computing hardware (which is relatively cheap nowadays) and the software itself plus a handful of low-cost actuators to do things like turn the steering wheel. Even that is optional, because physically moving things to tell the vehicle to turn or accelerate/brake isn't really necessary anymore. In many cars, including the LEAF, turning the wheel just sends signals to the electric-assist steering rack to turn the tires, there is no physical connection between the two. It's a fully fly-by-wire system. Even accelerator pedals have now long lost their physical connection to the engine in nearly every car on the road. In fact, the most sophisticated part of the Autonomous Drive system is the AI. It literally builds "pictures" of things going on around the car through the radar, lasers, and camera systems the car has. It then matches those pictures to a database of known objects and, along with spacial recognition, determines how to react. Our brains do this naturally and within nanoseconds and computers can now do it too. The amount of computing power required to do it is far smaller than one might imagine. An average laptop for sale off the shelf today can likely do a pretty good job of this, if it had the right software and a camera or two to work from. The sophisticated "facial recognition" software used to match camera images from security systems to known people are usually run from a small rack of servers whose total space requirement is likely smaller than your desktop computer. Object recognition is easier than facial recognition, so it's easy to see how this could be done for a few hundred dollars in parts. This is how Nissan can promise to do it for about $1,000 in upgrades. Most of the expensive hardware will already be in place on the vehicles they'll launch Autonomous Driving on, so it's just a matter of adding some computing power and software. Which car will see it first? This is a big question, but not too difficult to answer, given the information Nissan has already dropped about Autonomous Driving. They're testing it in the LEAF, which may be a candidate, but it's more likely that a luxury version of the LEAF, perhaps in Nissan's Infiniti line, will be the debut vehicle for this. The LEAF itself is an obvious choice, since it's Nissan's flagship "techno-car," but it doesn't have many of the built-in systems required for self-driving to work. They have to be added (currently). 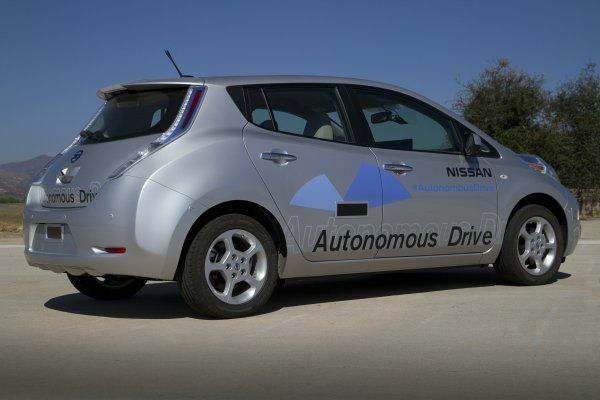 Nissan has said that the Autonomous Driving upgrade will be "a $1,000 option in a luxury vehicle." The LEAF is not a luxury vehicle. But speculation is that Nissan plans to make an all-electric Infiniti, basically an Infiniti LEAF in much the same way the Cadillac ELR will be a luxury version of the Chevy Volt. That would make more sense. Obviously, other Infiniti vehicles would also make good candidates were such a battery-electric luxury vehicle not being offered. Putting everything else aside, it is obvious that Nissan was not just making headlines when it announced that there would be an Autonomous Driving car on dealership lots by 2020. They also weren't kidding when they said it would be a $1,000 (or so) upgrade option for a luxury car. Everything makes sense if it's all pulled together. The debut vehicle, since the testing is being done in a LEAF, would be either a luxury version of the LEAF or a similar, electrified vehicle in Nissan's Infiniti lineup.